Technical risk management is very important in collecting and controlling project risks especially CubeSat Project, therefore it is inherent part of basic project phases and its system engineering. The goal is to develop a technical risk management by categorizing the basic project phases into three scenarios based on the launch stages i.e. pre-launch, launch and post-launch stages. Each scenario of risk has to be classified either as a mission or implementation risk referring to the standard definition. The use of this developed technique increase the accuracy of assessing the risks of the CubeSat Project. Technical risks of subsystems such as Communication, Electrical Power, On Board Computer, Mechanical & Structure, Payload and Attitude Determination & Control Subsystem have been assessed and mitigated using either quantitative assessment method or qualitative assessment method after defining the severity level of technical risks. 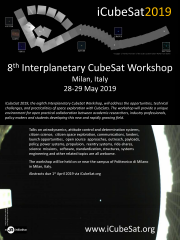 Interplanetary missions require more accuracy to identify the level of technical risks related to CubeSat subsystems with determination of best plan from developed mitigation approaches which could be the solution and successful operation for those exploratory missions. Key to a very accurate severity level, is the developed categorization methodology in order to reduce level of technical risks in subsystems and determine the best plan from developed mitigation approach for them as well.